It's not like the rivalry between the Rangers and Flyers really needed another shot of adrenalin, but the fight between Daniel Carcillo and Marian Gaborik on Thursday night has done just that. 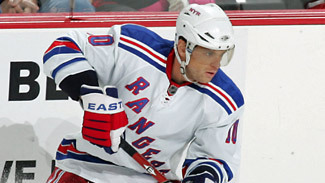 The Rangers contend Carcillo should not have dropped the gloves with Gaborik, one of the League's top players. The Flyers say Gaborik instigated the fight and Gaborik got what he deserved. Outside observers question why no Ranger came to Gaborik's aid. "It happened and it is what it is," Gaborik told Bill Beacon of the Toronto Globe and Mail on Saturday in Montreal. "You get in a zone and get mad and things like that happen. I don't think I'm the only one. ... So, I wasn't really thinking." Let's face it, anyone who has ever played has been there and done that despite their status in the game. Hockey is a game best played with passion and if Gaborik got mad and dropped 'em with Carcillo, that's the way it is. But the situation is far from the norm around the NHL and that's what prompted Rangers coach John Tortorella to say there was "no honor" in Carcillo's actions. But to be fair again, Gaborik escalated things and Carcillo is not going to duck the challenge. For his part, Carcillo said he was surprised by Gaborik. "I'm still shocked it happened," Carcillo told reporters this past week. "But fights happen and just because he's their best player doesn't mean he can't fight." "He can say whatever he wants," Gaborik told Beacon. "I don't think that's what should happen, but we're playing three more games (against Philadelphia) and I don't think he's going to do such a thing again because we're playing them again in our building and it's going to be physical." Hey, it is what it is, to agree with Gaborik, but the fight and its fallout will add some additional spice to the three games remaining between the teams this season. In 1973, a pro team that played on Long Island rallied around the battle cry "You Gotta Believe!" That was the late Tug McGraw and the New York Mets. Flash forward to 2010 and the team is the New York Islanders and the words of wisdom -- albeit delivered more matter-of-factly -- come from Doug Weight. "We're good enough to beat a team in a seven-game playoff series," Weight said, "and we're good enough to be in the playoffs. "It's not a process, it's here," Weight said. "We're good enough." Weight's words to Katie Strang of Newsday are backed by the NHL standings that right in the thick of the hunt for a Stanley Cup Playoff berth. "Our scouting staff has done a good job of finding character," Isles coach Scott Gordon told the New York Post. "We don't have a bad apple on our team. "(John) Tavares and (Josh) Bailey are mature kids at 19 and 20. I couldn't compare myself at what I was like at 19 to what Tavares is. We haven't come close to seeing what (Kyle) Okposo can do offensively, but even when he was not scoring, he was one of our most important players for what he brings every night." To be fair, Tavares, Bailey and Okposo better be the real deal since they represent a big part of the Islanders' treasure as first-round draft picks. But the Islanders also are received some terrific performances from players who were question marks. * Could Dwayne Roloson deliver in goal at age 40? He sure has. * Could Matt Moulson earn full-time minutes? Boy has that been answered in the yes column. * Could Mark Streit be counted on as a No. 1 defenseman. Again, another yes. * Could a lineup than in no way resembles the dynasty of the 1980s be successful on more hard work than anything else? "That's a source of great pride for our club," Weight said. "It's almost become a sort of rallying cry for us before the game." As McGraw said, "You gotta believe!" But lessons remain -- Despite their strong play of late, the Islanders still have to learn the value of killer instinct. Against the Devils on Saturday, they faced a foe that has been struggling offensively. The Isles were excellent for 40 minutes, even holding New Jersey to a single shot in the second period, but they didn't finish the Devils off. And New Jersey rallied for the 4-2 win in the third period. "That was the game right there," Kyle Okposo said of the third period. "We had a bad period and we have to correct some things." "That's a game you hope you don't look back on at the end of the season and say those were two points we should've had that cost us the playoffs," goalie Rick DiPietro told Newsday, "but we'll learn from our mistakes and get right back at it." Terrible timing for Danis -- It wasn't so much the opportunity to play against his former team Saturday, it was the chance to play against any team that made a bout with a bug for disappointing for New Jersey backup goalie Yann Danis. Danis has not started a game since Nov. 21, which is an occupational hazard for any backup to Martin Brodeur, but he was likely going to get the start against the Islanders on Saturday until illness took the chance away. Danis got sick Friday and remained in Jersey when the Devils bussed to Long Island. He got to the rink Saturday to dress for the game, but by then, any chance of starting was gone. "I don't know if it was the flu or food poisoning," Danis told Tom Gulitti of the Bergen Record. "I woke up (Friday) and felt nauseous." Although Danis felt better after Friday's morning skate, he felt worse when he got home and slept the entire afternoon. "I came to the rink and felt a little bit better, but as the game went on and the night went on I started feeling worse and worse." Rangers remain a mystery -- Trying to figure out the Rangers is a baffling experience. In back-to-back wins against the Canadiens and Lightning, New York scored 14 goals and appeared to have found the formula for secondary scoring that has been such a problem this season. But shutout loss to the Flyers on Thursday and the Canadiens on Saturday, a 6-0 stinker at Bell Centre, instead makes it four games of the last seven in which the Rangers have failed to score at all. "To play two great games and then have two doughnuts in a row, it's really tough," defenseman Dan Girardi said. "I think they were stronger," defenseman Marc Staal said told Andrew Gross of the Bergen Record. "There was a lot of stuff jumping around and a lot of pucks sitting in front of the net that they were getting second and third whacks at." Henrik Lundqvist allowed 4 goals on 15 shots and 3 goals in 3:42 of the second period and was pulled against the Habs. "When you give them time and space in front, it's going to be a tough time for us," Lundqvist said. "If you give up four goals, or three that fast, you have to expect something might happen. I'm definitely not happy not to finish. At the same time, I understand we needed a change." It doesn't get any easier for the Rangers, who face the Penguins at Madison Square Garden on Monday night. Emery appears to be 'The Man' -- Ray Emery now has made five straight starts for the Flyers as coach Peter Laviolette looks to see if he is completely recovered from abdominal surgery. He appears to be fully mended. Emery took the loss against the Penguins on Sunday, but isn't going to be faulted in a 2-1 decision against Sidney Crosby and Company. Emery earned the win Saturday against the Carolina Hurricanes, so perhaps he passed an even greater hurdle by starting and playing well on successive games. 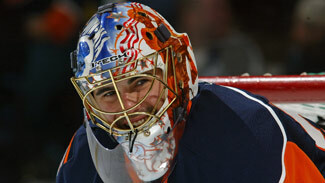 Emery also earned a shutout Thursday night against the Rangers in his third start since coming off the injured list. For the season, he is 14-9-1. Emery said it wasn't easy sitting out and watching another goalie take the team on a good, sustained run. He's rooting for his team, of course, and said so at every opportunity. "It's different when you have time off, you have to think about things," Emery said. "Then you get back in there and you don't have to think about as much. Everything flows a bit more smoothly." Surgeries leave scars and while Emery is better, there are still reminders he's healing. "I'm feeling pretty good. It's something that I still have to take care of. I'm feeling good, better than before (the surgery)," Emery said. "You've got to remember he had surgery, he was off a long time, he wasn't taking any shots, and you're talking about a very difficult position -- one of the toughest in professional sports," Laviolette said. "I think the biggest thing for him is just to get time and get comfortable in there." And Laviolette is providing that opportunity. On the road again -- The Pittsburgh Penguins had a unique rooting section in Philadelphia on Sunday against the Flyers and Monday night in New York against the Rangers. The fathers of the players and team staff are along for the trip, part of the annual gathering most NHL teams now undertake. "For dads that don't get a lot of male bonding, it's great," goalie Brent Johnson told the Pittsburgh Post-Gazette. "My dad just gets jacked for it. They talk about old times. Nothing better than that." "It's nice," Sidney Crosby said. "I'm lucky. My dad gets here fairly often. But for him to travel with us and see what we go through, that's really special. A lot of our fathers didn't get a chance to play in the NHL, and that was their dream as well. So they get to kind of live the life for a few days and meet the other fathers, share stories." Fighting for a break -- The New Jersey Devils will be the first to admit to having enjoyed an excellent season despite a lot of injuries. But adversity in the form of a struggling offense has made the last 10 games or so the most challenging of the season thus far. "We move the puck really well. The thing is, the player that shoots the puck doesn't find the net," coach Jacques Lemaire said after Friday's 3-1 loss to the Canadiens. "It's that simple. Puck movement is good. We hold onto it. We're moving and making good passes. But we have to get the shooters. "You need a break at a time. We've seen a lot of shots go in off a guy's stick," the coach said. "Look at the (Mathieu Darche) goal last night. It hit off our defenseman's stick and goes in. "What I'm saying is, this is a break that the other team gets. By working I believe we can get those breaks. I thought at the start of the season we were getting them. Now we've just got to work a little harder to get them. Because goals don't come easy. We have one line that is producing. The other lines don't produce as much." So Lemaire was not his usual understated self after Saturday's 4-2 win against the Islanders. "This is a huge win for us, a team win," he said. "To me, especially in our situation, we have (five) regular players out of the lineup (with injuries) and we were struggling for wins, this was huge." "It was certainly a much-needed win and a great feeling to win," defenseman Bryce Salvador told Tom Gulitti of the Bergen Record. Around the Atlantic -- Colin White couldn't bear to look. After taking a major for boarding and a game misconduct for a hit on the Islanders' Sean Bergenheim on Saturday night, the New Jersey defenseman was too upset about putting his team in a hole to see what happened on the ice. What he would have seen is the Isles score twice with the man-advantage. But the Devils rallied for a 4-2 win. "The five minutes we deserved," Jacques Lemaire said of the penalty. 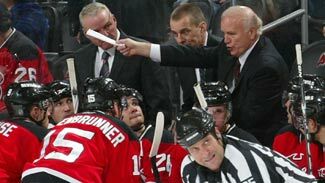 "It was a thing the defenseman should've known. The player had his back turned. I totally agreed with the call." ... Matt Zaba wasn't happy with his first NHL game, a relief appearance in a blowout loss to the Montreal Canadiens on Saturday night, but the New York Rangers rookie will take it. "If you're making your debut, it might as well be against the Canadiens," Zaba told the New York Daily News. "It wasn't bad, but it would be better under better circumstances." ... Ales Kotalik, whose has been scratched for five straight games by the Rangers, told Andrew Gross of the Bergen Record he has not asked to be traded. "Are you serious?" Kotalik said "Why would I? I wouldn't hurt the team. This is the situation. I'm just trying to be a good teammate and support the guys." ... Flyers defenseman Ryan Parent will miss six weeks after undergoing back surgery Sunday. Parent will have a disk fragment from his lumbar spine, GM Paul Holmgren said. Parent has missed the last 14 games because of the injury.